As women we were raised to become mothers. We have babies thrust upon us when we, ourselves are still babies. We are read fairy tales like Cinderella and Snow White that are rescued by a handsome prince and live happily ever after. Everything we learn and experience when we are kids, contributes to the formation and growth of this inner part of ourselves to help define who we are as women. We were taught female appropriate topics at school like sewing, cooking, English and art. We were told in the TV shows and movies we watched, the news, society, our mothers, grandmothers and aunties that in order to live happily ever after, you get married and have children. We were raised in a way that tied motherhood to our identifies. So, if that is our generation then why am I on the only one of my 24 cousins who choose not to have children? Why do close to 1 in 4 women now vote ‘no’ to having a child? Childlessness has grown in all OECD countries. Due to part to birth control, later marriages, the emergence of two career couples and changing priorities, this trend is now evident worldwide. Why is it that society has a hard time wrapping its mind around the fact that not all women want to have children? There is an expectation that not only should we have children, we are supposed to want to have children. I can tell you that my biological clock has never ticked – it is not even stuck on permanent snooze – it has no batteries! I have never once yearned to procreate and that doesn’t make me weird or not a woman. It makes me who I am. I choose to make my own rules and have other equalling fulfilling areas of my life. I choose puppies over parenthood, being a Rockstar Aunty, career, travel, giving back through charity and shoes (lots of shoes). What I want you to consider is what life is like as a childfree woman. When you read about some of our experiences in my book then you might consider how you will change the conversations you are having with all the women in your life, not just us childfree chicks. Childfree women experience rude questions and dire warnings about a loveless barren future that we will regret. We are often described as strange, unnatural and selfish. You see to some, not having kids is a social faux par. In a world when bullying isn’t accepted, it seems it is OK to bully and verbally attack other women for their strange choice to not have children, because you will regret it you know. After all these years of feminism and being told we can do anything, why does our decision not to have children remain under scrutiny by psychologists, politicians, statisticians, society, the media and mothers? Womanhood equalling motherhood has long been accepted as the norm but times are changing. Isn’t feminism supposed to be about giving women choices? And shouldn’t those choices extend to whether or not you want to have children? 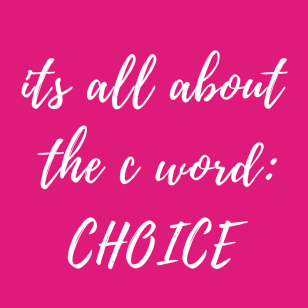 What you need to remember is that is that the childfree revolution is all about the C word. Choice! When you remember that we are all different and it is OK to play by your own rules then you allow your daughters, sisters and aunties to be who they truly are. All women should be allowed to make choices that are right for them and not live their lives for others. This is not about mums versus’s non-mums. This about the choice. The C word should allow us to separate the term women and mother – one is not dependant on the other. I am not anti – kids, I am just anti-kids for me. I choose Choo’s over children- that is my C word of choice. Unlike a career choice or buying a pair of shoes, you cannot change your mind when it comes to having a child. This book is a field guide, an anthropological study into why we feel the pressure to have kids and the different factors that influence our decision. I believe in choosing to live your life for you. Blaze your own trail, your parents and your friends will get over it.